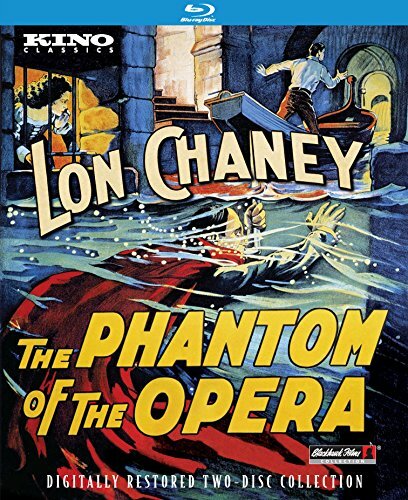 NEW YORK, NY -- SEPTEMBER 8, 2015 -- Kino Lorber proudly announces the definitive Blu-ray and DVD release of the silent horror classic The Phantom of the Opera , starring Lon Chaney, the original film version of the celebrated Gaston Leroux story about a mysterious phantom who haunts the chambers and catacombs deep beneath the Paris Opera House, which has inspired countless remakes and adaptations over the years. Lavishly produced by Universal (including the unprecedented, meticulous re-creation of the Paris Opera House on the studio backlot), and long considered one of the essential films of the silent era, The Phantom of the Opera has lost none of its power to frighten and entertain audiences since its release 90 years ago, thanks to the iconic performance of Lon Chaney in the title role. Set to street on October 13th, just in time for Halloween, this digitally-restored, two-disc collection gives audiences the chance to see two versions of the film: the 1929 theatrical version, presented at two historically-accurate projection speeds and restored from 35mm elements by Film Preservation Associates (including the Technicolor Bal Masque sequence and hand-colored scenes that replicate the original Handschiegl Color Process), and the original 1925 cut (which contains scenes cut from the 1929 release version). Also included are rare, lengthy excerpts of the partially-lost 1930 sound re-issue version. Disc one includes the 1929 theatrical version, with a choice of three scores: one composed and performed by the Alloy Orchestra, a theatre organ score arranged and performed by Gaylord Carter, and a musical setting composed by Gabriel Thibaudeau. It also features an audio commentary by film historian Jon C. Mirsalis. Disc two includes the alternate 1925 release version, featuring a musical setting arranged and performed by Frederick Hodges. It also includes the excerpts from the 1930 sound re-issue, the original screenplay, the original theatrical trailer, an interview with composer Gabriel Thibaudeau, and two travel films capturing Paris in 1925: "Paris From a Motor" and "A Trip on the Seine". The SRP for the Blu-ray edition is $39.95, and the SRP for the DVD is $29.95. When it released The Phantom of the Opera on VHS in 1989, Kino Lorber was one of the first U.S. distributors to bring silent films to home video, and we are especially proud to bring back into release one of the cornerstone titles of its classic film library. A forerunner of the American horror film, and one of the most lavish spectacles of the silent era, THE PHANTOM OF THE OPERA has inspired countless remakes and imitations. But none can rival the romance and mystery that haunt every frame of the Lon Chaney original. This definitive edition presents the 1929 theatrical version, restored from archival 35mm elements by Film Preservation Associates, highlighted by the Technicolor Bal Masque sequence (in which the Phantom interrupts the revelry in the scarlet robes of the Red Death), as well as meticulously hand-colored sequences, replicating the Handschiegl Color Process. The film is presented at two historically-accurate projection speeds (each with two different soundtrack options). Bonus content includes the 1925 theatrical cut (which contains scenes that were removed from the 1929 release version) and lengthy excerpts of the 1930 sound version (which no longer survives intact). Two travel films capturing Paris in 1925: "Paris From a Motor" and "A Trip on the Seine"